About a hundred Christian families flee the Sinai after the murder of a Coptic priest and the beheading of a Christian businessman. Gunmen riddle churches with bullets. Christian stores are marked for possible attacks, whilst demonstrations target Patriarch Tawadros, "guilty" of supporting Morsi's ouster. Christians are likely to be scapegoated by Islamist groups and the Muslim Brotherhood. Cairo (AsiaNews) - More than a hundred Christian families have fled El Arish in the Sinai after receiving death threats from Islamist groups following the fall of Mohamed Morsi. On 6 July, a 39-year-old priest, Fr Mina Haroan Abboud, was killed. On 11 July, the body of another Christian, a merchant from Sheikh Zowayd, was found decapitated. He had been kidnapped a few days before. Currently, Coptic churches in northern Sinai have cancelled all services and meetings, except for a Mass on Friday. No Christians are left in the towns of Rafah and Sheikh Zowayd. The Sinai Peninsula has always been a home for Islamist groups, many of them linked to Hamas in Gaza. For decades, they have fought against the Egyptian army as it tried to stop weapon supplies and smuggling into the Gaza Strip. Under Morsi and the Brotherhood, the army had reduced pressure on them but now the military is back in force following the fall of Hosni Mubarak's successor. In the few days since Morsi's removal, the Sinai has seen dozens of attacks against police stations, army checkpoints, and individual members of the Armed Forces. But attacks have also been carried out against the Christians, "guilty" of supporting Morsi's fall. On 5 July, a Jihadist group using the name Ansar al-Shari'a in the Land of Kinaanah (i.e. Egypt) issued a statement promising to respond to the "war against Islam in Egypt," a war waged by "secularists, atheists, Mubarak loyalists, Christians, security forces and the leaders of the Egyptian Army." In its statement, the group describes democracy as "blasphemous" in assuming one of God's prerogative and warns of impending "massacres of Muslims in Egypt". Christians, especially Patriarch Tawadros, are accused of conniving with the army to remove Mohamed Morsi. Coptic Patriarch Tawadros and the Grand Imam of Al Azhar Mosque Ahmed al-Tayeb were present at the ceremony in which Morsi's removal was announced. In many pro-Morsi manifestations organised recently by the Muslim Brotherhood, al-Tayeb is branded as a "traitor." The Coptic patriarch has also been accused of betraying Egypt. Three days ago in Heliopolis, at least 2,000 young members of the Muslim Brotherhood wrote "Down with Tawadros" on the walls of a (Catholic) church during a demonstration that lasted several hours. It is likely that the Coptic minority will be scapegoated for President Morsi's fall and the Brotherhood's loss of power. 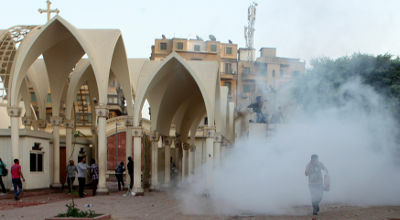 "Tensions are high," Christian sources in Egypt told AsiaNews, also because the Brotherhood, aided by infiltrated jihadists, is planning a series of anti-Christian terrorist attacks. Three days ago, the Christian village of Dabaaya was attacked by a group of armed men who burnt 23 houses and killed four Christians. One of them, Emile Nessim, had worked hard to collect the signatures for the Tamarod (rebel) movement that led to Morsi's fall. On 9 July, the Mar Mina Church in Port Said was riddled with bullets by a group of unknown gunmen. In recent days, a group of Islamists drew crosses on some shops owned by Egyptian Copts in Minya (250 km south of Cairo). People are afraid that this 'Nazi-style' gesture might be the prelude of a terrorist attack against the targeted buildings. Some sources note however that in general, after Morsi's removal, there has been a greater sense of reconciliation between Muslims and Christians, "a stronger solidarity against extremism and for national unity".